In early September I made a business trip to Singapore, and as ever I set up a stopover on my way home in the interests of breaking up the flights. Megan travelled to Paris on Friday morning and spent the day at the Louvre, while I spent fifteen hours and change working on trip reports from the slightly questionable comfort of an Emirates economy class seat. We began our morning at Parc Saint Paul where we hoped to experience Wood Express, a brand new ride from the Gravity Group. Unfortunately the lift hill motor was out of service for the duration of our visit due to an electrical fault, and though park maintenance was actively working to solve the problem they were nowhere near a fix by the time of our departure at 1:30pm. We subsequently learned via the European Coaster Club that a crossed wire had been identified at 5:00pm, by which stage we were over one hundred miles away. The miss was irritating, but far less than it might have been, as the park is just minutes away from an airport we fly through on a regular basis. Our first hit was Aerotrain, a custom Vekoma roller skater that formerly operated at the now defunct Funcenter in Portugal. The ride didn't make a huge impression on me at the time, and eight years later it remains forgettable. The only forceful portion of the layout is a left turn at the base of the first drop; once that is complete the rest of the journey does very little. That being said, the ride looks very nice in its new home, and the relatively high supports allow visitors to walk under the track while the train is in motion, giving some interesting photo opportunities. The average visitor would never guess that it was a second hand ride that once operated in an indoor location. Stop two was at Mini Mouse Cartoon, a Zamperla family coaster that I'd have skipped entirely had Megan not needed the credit. We were both able to fit in the same car towards the back, but the operator asked one of us to move due to a maximum weight limit, so she relocated to the front. The three laps we experienced were not massively thrilling, though we enjoyed them nevertheless. With that complete we enjoyed thoroughly disorienting rides on Telepherique, the stand-up spinning not-a-coaster that is listed as undefined on coaster-count.com. Adult riders that fall within the weight limit for this ride should bear in mind that it spins a lot, necessitating quite a bit of upper arm strength to hold on. We managed it, though I wasn't sorry when my circuit came to an end. Our next stop was at a home-spun walkthrough dating from 1985 that I'd somehow managed to miss on my previous visits to the park. Chateau Hanté blends high quality animatronics with unusual details that could easily be missed if you don't look closely. One scene features a skeleton at a dining table with a bottle of wine, but a deeper glance reveals a naked figure resembling Hitler in the corner behind whose right hand is doing something one would not definitely not expect to see at a family park. Another features a zombie in dungarees and flannel shirt paired with a sallow-faced human in evening wear who looks remarkably serene given that a stick is protruding from both sides of his neck. The park is home to one of two known examples of the Formula PAX, a thoroughly demented Wild Mouse design that I last encountered over five years ago during a trip to Russia. The version at Parc Saint Paul was retrofitted with a new control system by Soquet following an accident, but otherwise Formula 1 is as it would have been when it left the Moscow factory; an airtime laden thrill machine with reversed track banking that I'd argue to be one of the finest rides of its type ever built. The Pax Company is still trading, but sadly they ceased manufacturing roller coasters in 2013; as of this writing twenty-three of their thirty-seven known coasters remain in service, of which I've ridden just five. I'm going to try to do something about that over the next few years before it's too late. Our lap on Souris Verte was forgettable, as we had the longest queue of the day for a spinning coaster that barely spun at all. 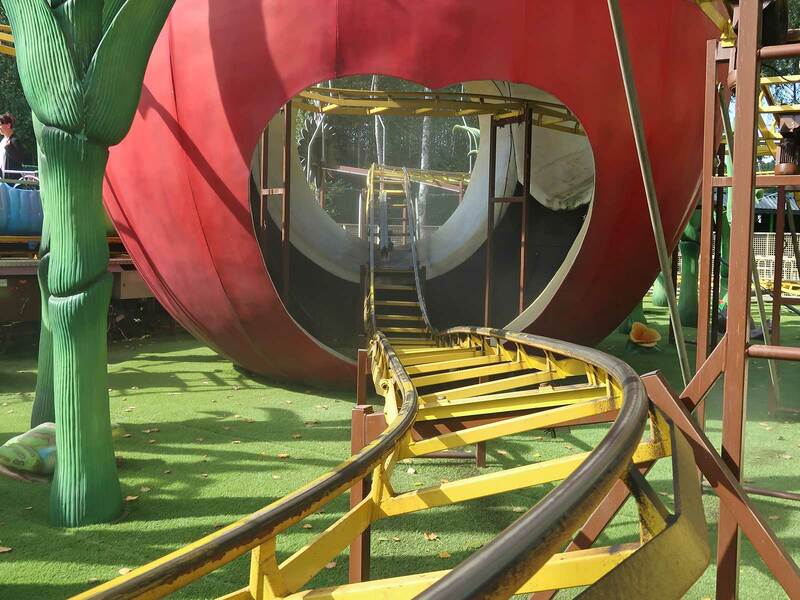 We were much more taken with Pomme, a DAL family coaster that was unthemed on my last visit to the park back in 2008. Since then it has been upgraded with a mist-filled fiberglass apple installed above the drop, rather than in the more usual location at the apex of the lift hill. In addition to this the open spaces at each end of the layout have been filled with oversized vegetation and snails. The upgraded ride looks great, to the point that I'd encourage even those sensible people who don't count their coasters to experience it for themselves. We arrived in the car park for Le Fleury after nearly two hours on the road to a dispiriting sight; though we could see various rides moving there was absolutely no sign of activity next to the roller coaster. Sure enough Imoogi was not in operation today. It was tempting to abort in favour of our next stop, but we decided that we might as well enter the park anyway to ride the park's powered coaster, an oval-shaped ride very clearly aimed at those under the age of eight. We met up with our friends Bruno and Anita, and after some brief pleasantries headed as a group to the ride. The Airplane operator was clearly amused at four adults riding together without children, but he checked our restraints philosophically and sent us for several laps. It looked at first glance like an airtime hump on one side of the course might do something, but the train crested it at no more than two miles an hour, to the point that the G-force meter I was running on my phone failed to register any vertical changes at all. It was more than a little embarrassing to have paid park entrance for something so pathetic, but on the plus side it should allow our next visit to take place without explicit reevaluation of life choices. The park doesn't have all that many rides, though one that all visitors should make the time for is L'Epee d'Odin, a small SBF Rides tower operating a lengthy programme with a mix of full height and staggered drops. Megan also decided to try Catapulte, a single person reverse bungee with a full body harness in place of the usual seat in a cage. She described the experience as violent, validating my decision to give it a miss; I've long since reached a point in my life where I'm not prepared to do rides with bungee cords due to the forces inflicted, though I remain very fond of the more modern designs that use banks of springs. Many years ago I made a quick stop at Parc Les Poussins for the Big Apple. 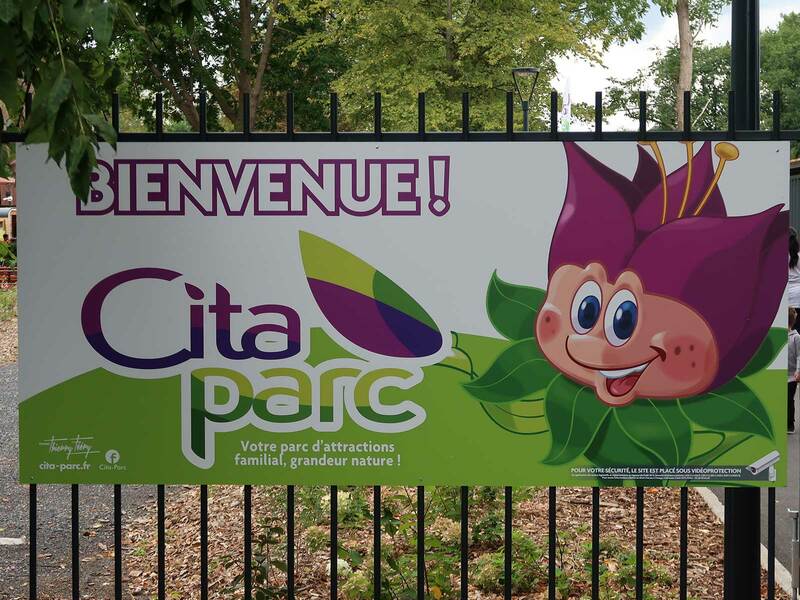 At the time I took no notice of the rest of the park, which is a shame in hindsight as the place was bulldozed at the start of this year to make way for Cita-Parc, a completely new park with half a dozen themed family rides supplied through Preston & Barbieri. The ticket desks at the new park have a sign indicating that tokens from the old park are no longer valid, and were that notice not present the average visitor would never know that another park had once existed on that location. 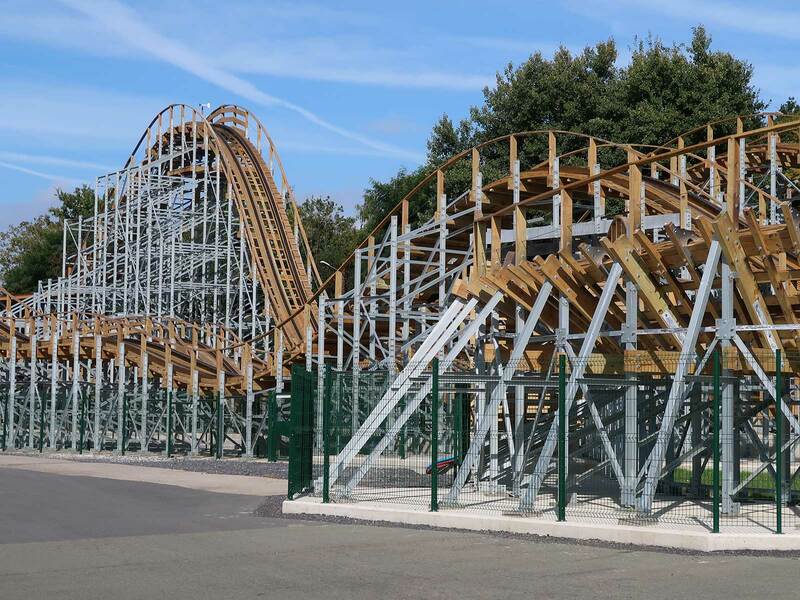 The star attraction in the new park is Requin Express (#2502), the fifth worldwide installation of the 30x14m Family Coaster layout that premiered at Kinderstad Heerlen in 2013. Our first lap on Shark Express was in the second row, which felt very much like sitting in a massage chair due to near-continuous vibration. Our second lap in the back row was far smoother, and I'd recommend that readers retracing our steps aim for the back of the train if possible. Our visit to Lille wasn't planned around the presence of the Foire aux Maneges d'Ete, but we decided it would be rude not to make at least a quick stop given that it was no more than two hundred metres away from Cita-Parc. There were two coasters available, both of which we'd ridden before; we skipped Goulis (Coppier), but took the time for a lap on the prototype Reverchon Crazy Mouse (Degousset), memorable chiefly for the extra drop not found on the production models. We also partook of two separate dark rides. The first was Horror-Spuk, a two level ride with a facade featuring an oversized clown mannequin dressed in a black and white striped jumpsuit. The individual had life-sized zombie figures on their backs, and each one was decorated differently. Sadly the interior proved to be a significant letdown; the upper level had one solitary animatronic, and the lower floor was scarcely better. The one half decent effect was a lit up painting that morphed into a screaming banshee; aside from that, the experience was eminently missable. An actor right before the exit would ordinarily have compensated for a limited interior, but instead of doing something useful he chose to grip my neck uncomfortably hard, and I could have done without that. Ghost Train (Maury) on the other hand was in a completely different league. The ride spans three levels and features airtime bumps in places, to the point that it is almost tempting to describe it as a heavily themed powered coaster. There were several actors on duty tonight, including one dressed as Freddy Krueger who pretended to cut the throats of those waiting to board, and another who chased after moving cars with an extremely noisy chainsaw whose vibration could be clearly felt. Inside scenes were varied and interesting, and included several effects I'd not seen before. My favourite was an an animatronic spraying sparks in the air by scraping two pieces of metal; I found myself wondering how often the pieces need to be replaced. The highlight of the evening, as ever on a French fair, was Pouss-Pouss. All four of us took part in the first ride, and then Megan, Bruno, and Anita went back for a second. 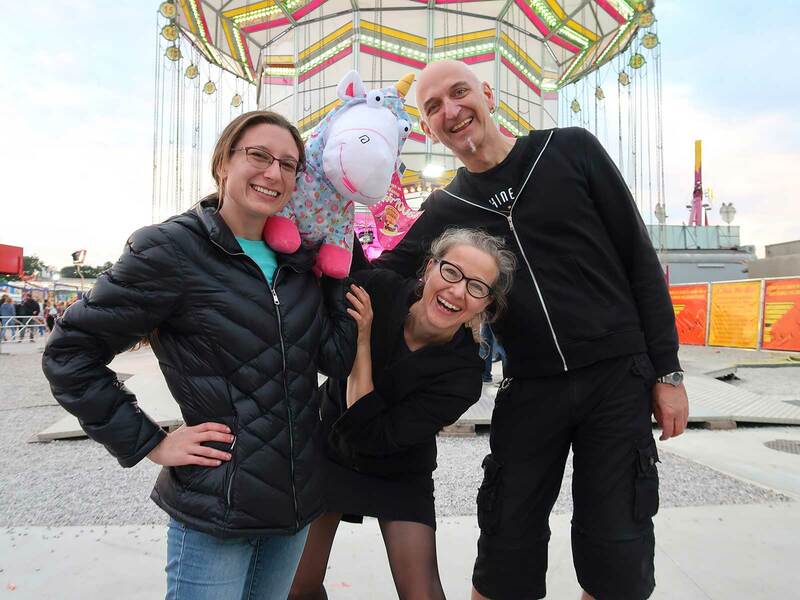 Teamwork by the three of them resulted in a win, and I'm reliably informed that Rosie the Unicorn has settled in comfortably in her new home in a living room somewhere in Germany.